10 a.m. til 4 p.m.
Entertainment: Live music all day with The Dollar Brother, Glenn Bolick and Friends,and more. Storytelling with Fred Frawley and Orville Hicks. Pottery: The wood kiln will be filled with facejugs, Rebekah pitchers, handformed animals, teapots, vases, pitchers, and more. 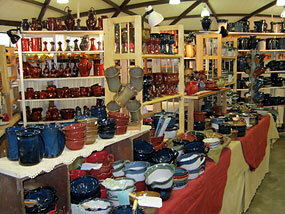 Be present at 10am for best selection of wood fired items, then shop our sales rooms for more pottery. Other Artists: Additional arts and crafts include quilts, goat milk soaps and lotion, leather, iron, and wood works, and more. Demonstrations: An interactive quilting party and a Gee Haw Whimmie Diddle Contest. Food: Food will be served. Free admission, bring chairs, no coolers, pets, or alcohol. Always the Saturday after Thanksgiving. Be present at 10 AM for the best selection of wood fired items such as Santas, and other face jugs, swirl vases, pitchers, candlesticks, and more, just in time for Christmas. Food will be served, Free admission, bring chairs, no coolers, pets, or alcohol. 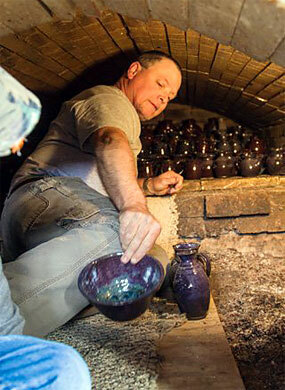 March: Catawba Valley Pottery Festival. Hickory Metro Center. 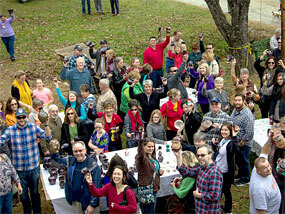 Catawba Valley Pottery Festival. April: Merlefest - Wilkes Community College located in the Heritage Craft Tent. October: North Carolina State Fair located in the Village of Yesteryear.